Sound Transit’s Link light rail makes trips from Angle Lake Station to the University of Washington through downtown Seattle making 14 stops along the way, including downtown Seattle and Sea-Tac Airport. Trains arrive every 6 to 15 minutes, depending on the time of day, and take about 40 minutes to travel between Sea-Tac International Airport and Westlake Station in downtown Seattle. One-way fare for adults ranges from $2.25 to $3.25. 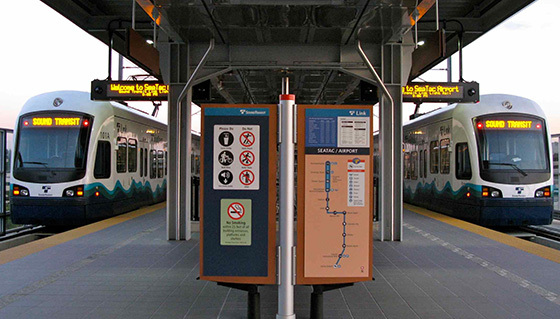 Schedules and station maps are available on the Sound Transit website. King County Metro Transit provides bus service in downtown Seattle and outlying neighborhoods in King county. Time-tables and route maps are available at the Transit Information Center in the tunnel under Westlake Center at 4th Avenue & Pine Street, or can be found on the King County Metro Transit website. King County Metro also has a mobile app available for iPhone and Android. 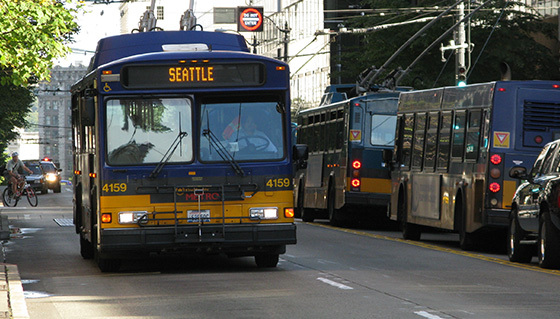 An all-day regional transit pass is available for visitors to Seattle. 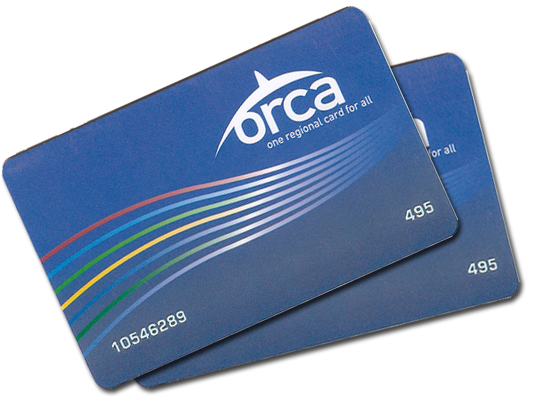 These $8 all-day passes are loaded onto regional transit cards ($5 each) at all ORCA vending machines and are used for unlimited riding on all local public transit (excluding the Seattle Monorail and Washington State Ferries). Transit pass value covers $3.50 per ride. 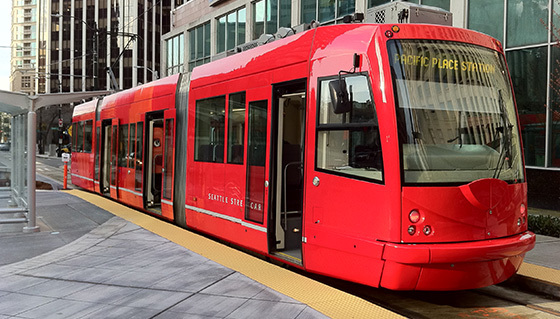 The South Lake Union Streetcar makes 11 stops through the South Lake Union area. Streetcars arrive every 10-15 minutes and run from 6am to 9pm (Monday-Thursday), 6am to 11pm (Friday & Saturday), and 10am to 7pm (Sunday & holidays). Adult fare is $2.50. Schedules and maps are available on their website. 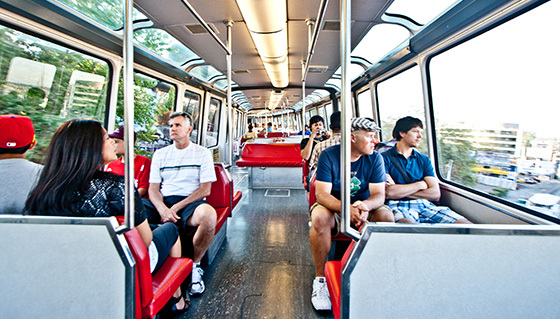 The First Hill Streetcar makes 10 stops from the Chinatown-International District through Capitol Hill. Departures are every 10-25 minutes and operate from 5am to 1am (Monday-Thursday), 6am to 1am (Friday & Saturday), 10am to 7pm (Sunday) and 10am to 8pm (holidays). Adult fare is $2.50. Route maps and schedules are available on their website. The iconic Seattle Center Monorail travels between Westlake Center in downtown and Seattle Center at the base of Queen Anne hill. Regular operating hours are between 7:30am and 11pm, Monday-Friday, and from 8:30am to 11pm, Saturday & Sunday. Trains depart every 10 minutes and the trip takes only 2 minutes each way. 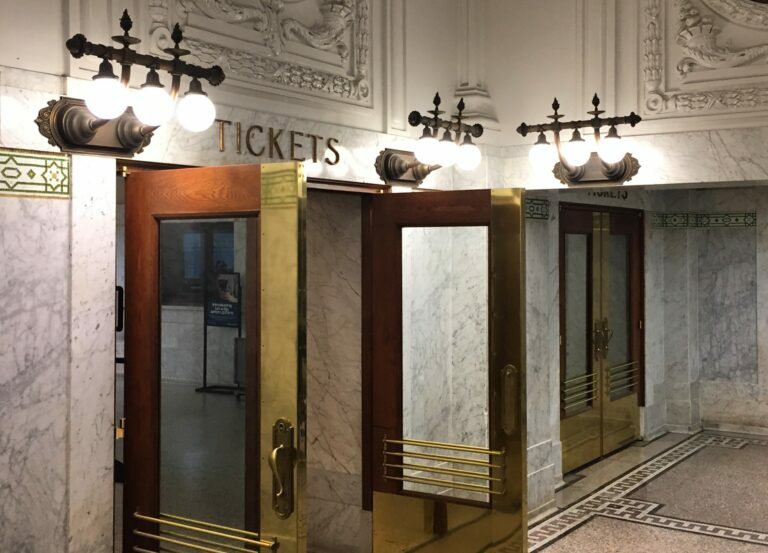 One-way fare for adults is $2.50; tickets are cash-only at the ticket window. Schedules, information and FAQs are on the Seattle Center Monorail website. At Sea-Tac Airport, taxis and ride-sharing companies are available on the third floor of the parking garage. One-way rides between the airport and downtown range from $40-$55. To arrange for a limo, town car or taxi ride in advance, use any of the travelers’ information boards in baggage claim or visit the ground transportation information booth on the third floor of the parking garage. Contact our concierge team at the Seattle Visitor Center for referrals for specific transportation companies based on your personal travel needs. 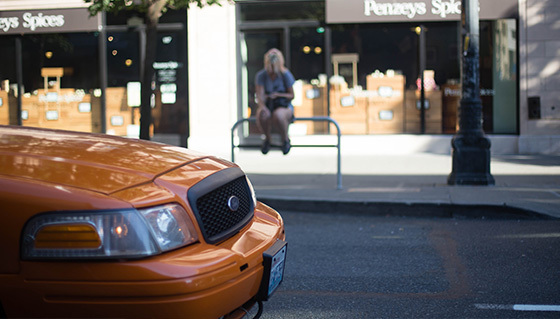 In downtown Seattle, Uber, Lyft, and metered taxis offer in-city transportation from local drivers. All rides can be scheduled using smartphone apps. 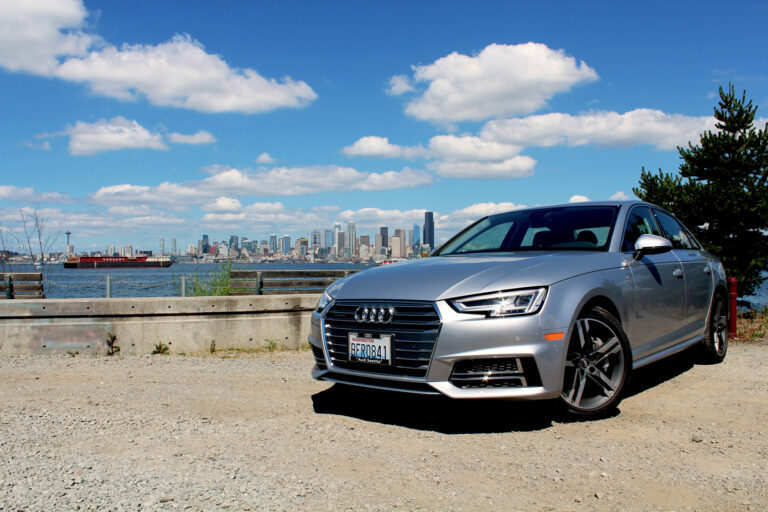 All car rental companies providing service at Sea-Tac Airport are located in the off-site car-rental facility. Dedicated shuttle buses run 24/7 to pick up passengers outside baggage claim at the north and south ends of the main terminal. If you prefer to enjoy the city using public transit when first arriving, car rentals are available at multiple downtown Seattle locations. Ask our Seattle Visitor Center team for referrals or assistance. Visitors can rent vehicles by the hour from Zipcar or by the minute from Car2Go, Lime, or ReachNow. Hotel courtesy shuttles pick up and drop off passengers on the third floor of the airport parking garage at Islands 1 & 2. Shared-ride vans and airport services are available to passengers outside door 00 at the south end of the main terminal on the baggage-claim level. 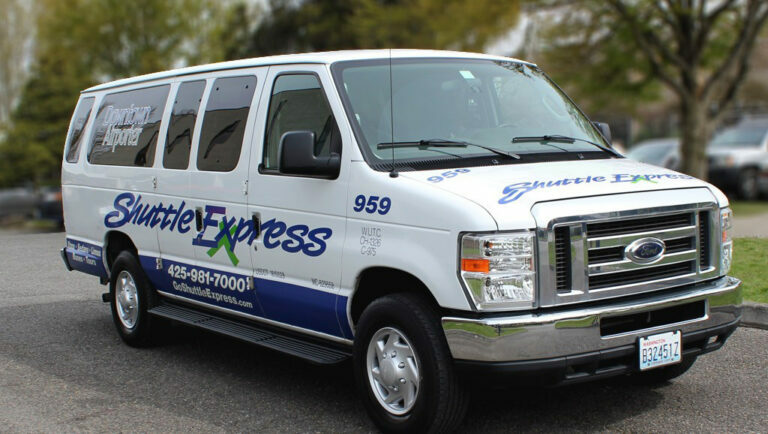 Shuttle Express Downtown Airporter offers shuttle service for under $20 per person to downtown Seattle hotels and also offer regularly scheduled cruise ship transfers. Looking to travel to or from Seattle via rail? Four train routes service Seattle’s King Street Station, located on the south edge of downtown. Amtrak has three routes: Coast Starlight travels between Seattle, Portland, and Los Angeles. Amtrak Cascades travels between Vancouver, BC; Seattle; Tacoma; Portland; Salem and Eugene. Empire Builder travels between Chicago; Minneapolis/St. Paul; Spokane; Portland; and Seattle. Got questions? Click here to contact our Visitor Services team!